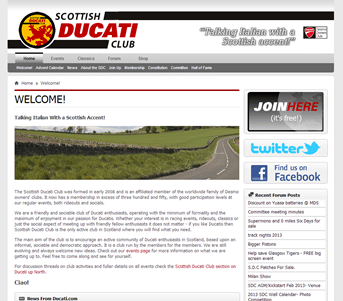 When the Scottish Ducati Club was founded in 2008, they had little idea they would be welcoming their 500th member in 2012. As the club quickly grew, it became increasingly important to keep their members up to date with the latest news and events. With a limited budget and an eye on the future not the past, the SDC decided to forgo the usual printed newsletter and communicate with members online. We developed a website and a logo for the Scottish Ducati Club, with elements suggestive of both Scotland and the heritage of the Italian marque. The website has a “liquid” layout – resizing to fit the browser window, and apart from the usual content pages, contains fun items like an online advent calendar, using digital photographs submitted by the members. 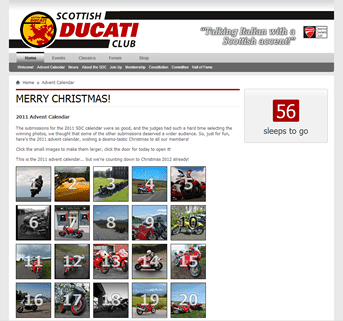 News is also extracted from the Ducati.com website via an RSS feed so it can be republished on the club site. A similar technique is used to include the latest forum items on the website.